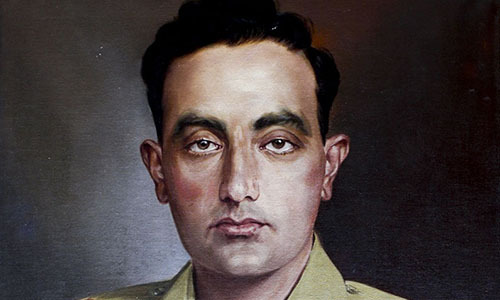 LAHORE (92 News) – The nation is observing the 50th anniversary of martyrdom of Major Raja Aziz Bhatti, who laid down his life for the defense of the country in 1965 war. Raja Aziz Bhatti was born in Hong Kong in August 16, 1928 where his father was living and working but his family moved to their native village in Gujrat’s Ladian before the independence of Pakistan. He enlisted with the newly formed Pakistani Army and was commissioned to the Punjab Regiment in 1950 and later was promoted to Major in 1956. On 6 September 1965, after India, Major Aziz Bhatti was posted as Company Commander in the Burki area of the Lahore sector, who chose to move with his forward platoon under incessant artillery and tank attacks for three days and nights in the defense of the strategic BRB canal. On September 12, 1965 while conducting a shoot against enemy tanks and infantry posing a serious threat to his company position, a shell from an enemy tank struck him on the left shoulder killing him instantaneously. Major Bhatti symbolized patriotism, self sacrifice and devotion to duty in its purest form and never considered personal comfort or safety. He led his men most gallantly with ability and personal example.